Political cartoon by Kirk Anderson. Image from The Skeptical Teacher. 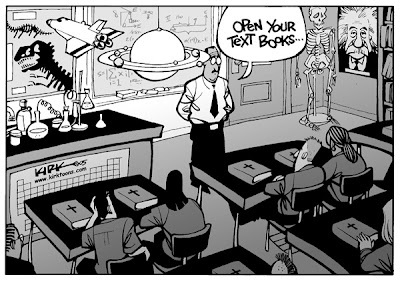 SAN MARCOS, Texas -- Thanks to the Texas Freedom Network (TFN), those who care about science in education have learned how the religious right will slip creationism into Texas’s textbooks over the next year. 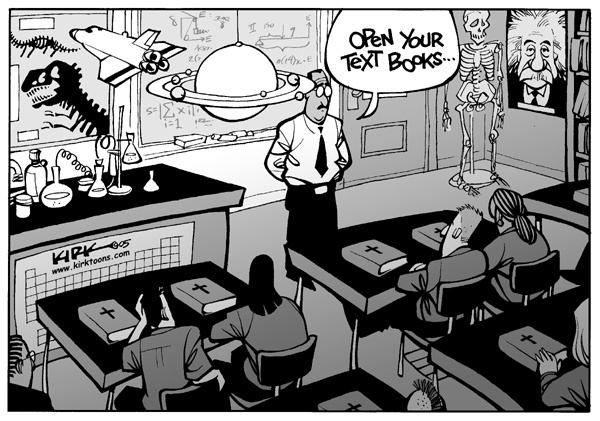 The Texas State Board of Education (SBOE) has appointed six creationists to review science textbooks, along with five others whose views on creationism are not known. The TFN promotes religious freedom and individual liberties against the agenda of the religious right. It is “a non-partisan, grassroots organization of more than 60,000 religious and community leaders” from throughout Texas. Creationism, often referred to as “intelligent design” in its newer incarnation, is promoted by those who do not accept the scientific consensus that evolution explains the origin of life on the earth. In 1962, when I began college at a small Methodist-related university, my biology teacher, while offering no apologies for teaching evolution as fact, also suggested that there was no inconsistency between belief in God and evolution. Belief in God is based on faith, the claims for which cannot be tested or verified. Evolution is based on science; that is, it is testable. Its predictions can be verified. The difference between evolution theory and “intelligent design theory” or “creationism,” as it was originally called, is that evolution is subject to testing and falsification. These faith-based theories are not. No one can test the belief that God created the earth and all of its inhabitants in six days 10,000 years ago. What we know is that the available empirical evidence establishes that organisms have existed on earth for 3.5 billion years. Simply put, “intelligent design” cannot be tested by any scientific method. It is a belief that claims a supernatural entity designed complex organisms, such as human beings -- an inherently religious view that falls outside the sphere of science. In 2005, the most extensive case involving “intelligent design” was concluded with a court finding that “intelligent design” is not science, but another name for “creationism.” The case, Kitzmiller v. Dover, was brought by parents in Dover, Pennsylvania, who objected to a decision by their school board to promote the teaching of intelligent design in their children's public school science classes. The breathtaking inanity of the Board’s decision [to adopt the ID Policy] is evident when considered against the factual backdrop which has now been fully revealed through this trial. The students, parents, and teachers of the Dover Area School District deserved better than to be dragged into this legal maelstrom, with its resulting utter waste of monetary and personal resources. Now the SBOE is heading in that same direction in Texas -- a direction it has been moving for decades in spite of the best efforts of educators, scientists, and the mainstream religious community. Textbooks to be used in Texas schools will be adopted in November. Since a majority of the reviewers of the science texts are “creationists” or proponents of “intelligent design,” there can be little doubt that science education in Texas is under attack and our children will suffer intellectually, and perhaps professionally, as a result of the religious beliefs of these reviewers. Because Texas is one of the major purchasers of textbooks nationally, students in most other states are affected by what happens in Texas. As TFN has noted, the public won’t learn about publishers’ changes to science textbooks until sometime in September. The process is so circumscribed that the names of the reviewers are not announced in advance and will not be made public until the changes are announced. Raymond Bohlin is Vice President of Vision Outreach for Probe Ministries in Plano and a research fellow for the Seattle-based Discovery Institute. The Discovery Institute promotes “intelligent design” over evolution. Founded in 1973, Probe works “to present the Gospel to communities, nationally and internationally, by providing life-long opportunities to integrate faith and learning through balanced, biblically based scholarship.” Bohlin has a doctorate in molecular and cell biology from the University of Texas at Dallas, making him a star performer for anti-evolution groups. He has edited an anti-evolution book. Probe and the Creation Science Hall of Fame (which has honored Bohlin for his creationist views by naming him a “Darwin Skeptic”) promote a fundamentalist, literal interpretation of the Bible’s creation story. Walter Bradley is a retired Baylor University professor of engineering who coauthored a book, The Mystery of Life’s Origins in 1984, that essentially launched the “intelligent design” movement. Bradley, founding fellow of the Discovery Institute’s Center for the Renewal of Science and Culture, is also listed as a “Darwin Skeptic” on the Creation Science Hall of Fame website. Daniel Romo is a chemistry professor at Texas A&M University and is listed as a “Darwin Skeptic” on the Creation Science Hall of Fame website. 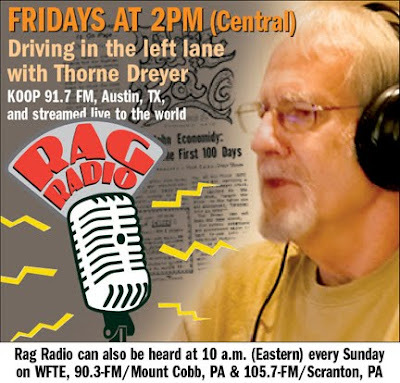 Ide Trotter is a longtime standard-bearer for the creationist movement in Texas, both as a source of funding and as a spokesperson for the absurdly named creationist group Texans for Better Science Education. Trotter, listed as a “Darwin Skeptic” on the Creation Science Hall of Fame website, is a veteran of the evolution wars at the SBOE. He testified before the board during the 2003 biology textbook adoption and again in 2009 during the science curriculum adoption. In both instances, Trotter advocated including scientifically discredited “weaknesses” of evolution theory in Texas science classrooms. Trotter, who has a doctorate in chemical engineering, runs his own investment management company and served as dean of business and professor of finance at Dallas Baptist University. He claims that major scientific discoveries over last century have actually made evolutionary science harder to defend. Richard White, a systems engineer in Austin, testified at an SBOE hearing on the proposed science curriculum standards on March 25, 2009. At the time, he advocated the inclusion of phony “weaknesses” of evolution in Texas science standards. White went on in his testimony to insist, illogically, that teaching the mainstream scientific consensus concerning evolution without also presenting its alleged “weaknesses” amounted to forcing religious dogma on students, even though evolution has nothing to do with religion and, thus, nothing to do with religious dogma. David Zeiger is a seventh-grade teacher at a Christian private school in North Texas. He holds a biochemistry degree from the University of Texas at Dallas. In 2009 he and his wife, Heather, opposed removing from the state’s science curriculum standards the requirement that students learn about the so-called “weaknesses” of evolution. Creationists have used that requirement to insist that publishers include discredited arguments challenging evolution, such as supposed “gaps” in the fossil record. Sadly, petitioning is currently the only recourse available against the takeover of the Texas SBOE by religious fundamentalists. Electing people to the SBOE whose primary concern is education, rather than pushing their religious dogma, has not worked out well the last few election cycles for those who oppose the view that religious faith should guide everything that is taught in the public schools.